It was a nice Saturday morning, one of those lazy mornings when you have not decided what you want to do. Though the sun was up, it was kind of cloudy and did not seem like a good day to be outdoors. And yet, I was dying to take the kids out. After a late lunch, we decided to go out any way. Thought it would be lovely to drive to another suburb and via the highway, we would get there in 20 minutes. The kids have not been there and it would be nice for them to get out of the house. As we drove, my daughter pointed out a rainbow in the sky. It was a huge one. And beautiful one, too. I have never seen such big rainbow across the sky. The colours were vibrant and as we drove nearer, my son said he could almost see all seven colours. Wow. 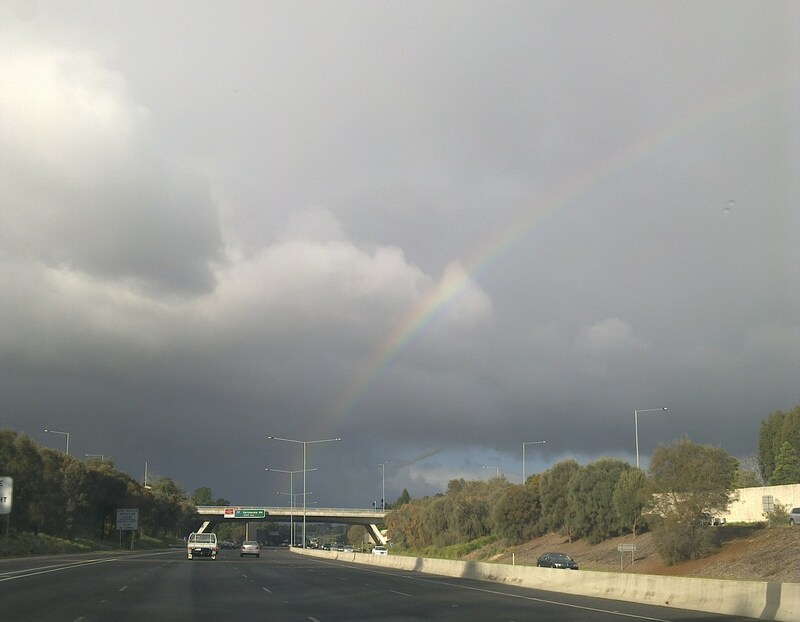 Just as I was thinking if I could stop the car to admire the rainbow, the rain came down. In a flash, the rainbow faded and disappeared. Black clouds loomed. In life, do we seize the moment? Sometimes beautiful moments come in a flash. If we embrace that moment and have it etched in our memory, it stays with us forever. I know for sure, my family and I will always remember this Saturday afternoon and the beautiful rainbow. This has been such an interesting week and I usually do not pay too much attention to politics. However, yesterday saw a momentous and dramatic day in the Australian political history, we saw a new Prime Minister for Australia, Julia Gillard. The first female PM for us. A poll from the streets showed people with mixed feelings and mmm, how would the electorate react to her? Well, she has been the Deputy PM for some time and people are used to her presence and she handled Industrial Relations, so she does have some connections to the ground. At this morning’s talk show, the presenter asked if people would start to comment on her as being a female, people would inevitably talk about her dressing, her hair, her lack of culinary skills, her no-kids family, etc… It seems like people would do that in particular to female candidates in the limelight. The commentator said no, people are more matured now and would judge her by the results she delivers and how she is going to lead her party and the country now that she has taken over Kevin Rudd’s position after the leadership spill in Canberra. It does seem like a tough job, with quite a few agendas on her plate. There are two things that struck me when Julia Gillard took over as PM. Personally I do like her and have admired her strength. Firstly when we are faced with what seems like a giant task, do we shirk and run away or face the issues and bravely do our best? Secondly, are we matured enough to look beyond the surface when judging people and let the results speak for themselves? Gillard seemed to take all this in her stride and I hope that one day when a similar opportunity comes our way, we will do the same. In the mean time, good luck Julia Gillard. We wish you the very best. This is a beautiful winter morning. Despite the cold and not wanting to get out of my warm bed, I had to drag myself out of it as the kids have to be in school. It is the same usual routine. But as I started the day, things start to change. My perspective of the morning gets better. Yes, even though it is 10 degrees in the house. Burr! We draw the curtains to let in the sunlight and start to toast the bread in the oven. The heat from the oven warms up the kitchen, not to mention the smell of toast and what a wonderful start to the day! Ths kids wake up and the house is alive with its usual noise. Ofttime we rush through the morning, getting ready for school or work and miss the beauty of a wonderful mornning. Hey, it is the start of a brand new day! Start with a positive step and that will see you through. Say “Good Morning,” to yourself and expect the day to roll out in an extraordinary way. And you know what? It will. I am not sure what time it is by the time you read this. Yet, tomorrow is another beautiful mornning. So starting tomorrow, as you read this, imagine yourself saying, “It’s a great morning and I shall have an enjoyable day at work/school.” And you’ll do just that, won’t you? You will have a great day with a great start.